FINCHES belonging to Emberizidae family are not true finches, but since they have the shape and size of the bird along with the conical bill, they are called finches. The family includes 281 species altogether, out of them 13 are Galapagos finches or "Darwin finches" which are the most famous birds in science. They are the main pieces of evidence on which the renowned English naturalist Charles Darwin propounded his theory of evolution by natural selection which is a milestone in the study of natural world ever since. While on a five-year voyage round the world on the HMS Beagle Darwin stopped at Galapagos Islands, in the eastern Pacific, in the year 1830. On the island he noticed that Galapagos finches looked very similar except their beaks which had a variety of shapes and sizes. After observing these birds and their bills, Darwin concluded that long ago only one species had arrived on the islands which later evolved into a various different species because different birds adapted themselves to different feeding habits which gradually gave rise to the different size and shape of the bill in each species. He also observed that every species has a specialised lifestyle and food so there is no competition among the species. After all these observations Darwin wrote a very famous book The Origin of Species which gave a new dimension to the study of natural world. 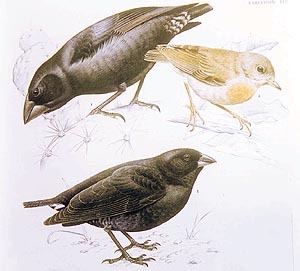 Darwin finches include a species commonly known as sharp-beaked ground finches. This small animal is the "vampire" of the bird world. It pecks holes in the wings and tails of the large birds and drinks their blood. This habit of the bird was unknown to the world of science until 1980s when a television team visited the Galapagos Islands. On a remote Wolf Island, a team saw these birds drinking masked boobies blood who seem unconcerned by this. According to experts, these small birds get not only extra food from the blood but also valuable moisture which is very necessary in the very arid environment. They not only drink boobies blood but also roll over their eggs away from them and feast over. Another notable bird among the Galapagos finches is woodpecker finch which is perhaps the most famous of all the tool-using animals, and the first to be studied carefully. Restricted to these islands, this small bird lacks the long, probing tongue of the true woodpecker, but makes up for this shortcoming by using tools. The bird seems to have filled a local niche in the absence of woodpeckers and must use tools because it does not have woodpeckers long tongue. In search for insects hidden in the crevices and the cracks of branches or wood the bird holds in its beak the tool lengthwise, which can be a twig of suitable length or large spine from a cactus plant, and finding a suitable spot, it pushes and prods the tool into the cavity until it either impales a hidden grub or disturbs it so much that it is forced to come out in the open. As soon as the prey is exposed, the tool is dropped and the food is eaten. The most astonishing part of the tool-using habit is that, like man and chimpanzee, woodpecker not only uses the tool but it also makes it. If the bird does not findes any suitable twig or spine, it will take a longer twig and start cutting and breaking it with its beak and feet, also removing side projections in the process, until it becomes of suitable shape and size. This is what chimpanzees do to bring out termites from their homes. Other members of the family are buntings. Out of breeding season these birds live in loose flocks, but during breeding season males occupy territories which they defend against other males. Americas have the maximum number of species, about three-quarter, of them majority are monogamous. These birds build cup-shaped nests which are lined with soft material like feathers or hairs. It is the female who sits on the eggs and nestlings and male helps to feed the young as they grow. Snow buntings are the most northerly breeding landbird. They nest as far up as the northern tip of Greenland. It builds its nest on rock outcrops in glaciers and snowfields, on high Tundra-type mountain tops and bare, rocky lichen Tundra. Living in-40°C temperature, it is very difficult to keep a small body warm, but snow bunting deals with the situation very effectively. It burrows in the snow to keep itself warm.